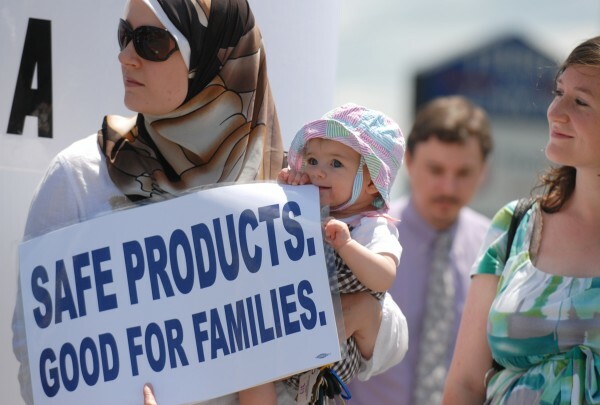 Seven-month-old Noorah Abdelmageed of Bangor chews on the corner of a sign held by her mother; Heather van Frankenhuyzen, owner of the Bella Luna women's clothing shop in downtown Bangor, during a 2009 protest on Union Street in Bangor of businesses selling products containing bisphenol-A, or BPA. AUGUSTA, Maine — A coalition of Maine health and environmental groups is preparing to launch the next campaign against bisphenol-A, or BPA, on the heels of tests that found the controversial chemical additive in 11 of 12 samples of baby food in the state. Additionally, coalition members are accusing some prominent baby food manufacturers of violating or attempting to evade Maine’s BPA disclosure rules. Roughly six weeks ago, new rules took effect banning the use of BPA in children’s sippy cups and other reusable food or beverage containers that are sold in Maine. On Tuesday, Feb. 14, groups will announce plans to petition state regulators to extend that prohibition to containers that hold baby food, infant formula and food marketed at toddlers. “BPA coming from diet is a significant source of exposure, and that is mostly coming from food containers,” said Amanda Sears, associate director of the Environmental Health Strategy Center, a member of the Alliance for a Clean and Healthy Maine. The Alliance for a Clean and Healthy Maine said recent tests prove that BPA — an additive linked in some studies to learning disabilities, reproductive problems, cancer and obesity — is leaching into baby food. That’s because BPA, in addition to being used as a hardening agent in plastics, is commonly used to make the epoxy liners that form a barrier between metal in cans or lids and food in those containers. The organization sent away for testing a dozen samples of baby food as well as three types of canned food marketed to young children, including Chef Boyardee macaroni and cheese and Campbell’s Dora the Explorer soup. Eleven of the 12 baby food samples and all three canned foods tested positive for BPA. The baby food manufacturers were Beech-Nut, Gerber, Earth’s Best Organic and Wild Harvest Organic, which is marketed by the Shaw’s supermarket chain. Gerber recently stopped using BPA in containers while Earth’s Best has pledged to stop using the chemical by October. Sears did not release details Monday about the levels of BPA found in the baby food. Although used for decades, BPA has come under heavy scrutiny in recent years as a growing body of medical studies suggest the chemical can pose risks to children and developing fetuses. The chemical industry, meanwhile, continues to defend BPA as safe and points out that such major governmental entities as the World Health Organization have said it would be premature to impose restrictions on the chemical. The debate occasionally crosses into the political realm, as well. Gov. Paul LePage strongly opposed the current ban because he did not believe there was scientific consensus on the issue. Maine lawmakers disagreed, however, and voted 35-0 in the Senate and 145-3 in the House last year to ban BPA in reusable beverage containers. The Alliance for a Clean and Healthy Maine and a group called Mainely Moms and Dads will hold a press conference in the State House on Feb. 14 to discuss the results of the product tests. They also will announce plans to use the state’s citizen-initiated rule-making procedure to request that the Board of Environmental Protection adopt rules prohibiting BPA in infant formula and baby or toddler food containers sold in Maine. Samantha DePoy-Warren, spokeswoman for the Department of Environmental Protection, said she could not comment on the rule-making petition until staff have had a chance to review the proposal. But she said the department appreciates the Environmental Health Strategy Center’s willingness to pay for product testing and has asked for the detailed results. “Given our [limited] resources, we really see a group like the Environmental Health Strategy Center as a partner,” DePoy-Warren said. BPA was banned in new, reusable beverage containers sold in Maine beginning Jan. 1 under rules adopted through the 4-year-old state law known as the Kid-Safe Products Act. As part of those rules, manufacturers of baby food, infant formula and some toys also are required to report to the department whether any of their products contain BPA and, if so, whether there were safer, alternative ingredients available. Some companies have been more forthcoming than others, however, according to both the department and the Environmental Health Strategy Center. In a Jan. 13 letter to DEP Commissioner Patricia Aho, the center’s Michael Belliveau urged the department to take action against seven manufacturers of baby food or baby toys for potential violations of the disclosure rules. The group has singled out two baby food manufacturers — Beech-Nut and Wild Harvest Organics — as failing to disclose the use of BPA in components of their packaging. DePoy-Warren said a “letter of warning” has been drafted for submission to Beech-Nut and is waiting final approval. Department staff have also drafted a letter to be sent to SuperValu, the manufacturer of Wild Harvest Organic products, requesting information certifying that the company is in compliance with state laws regarding BPA, which DePoy-Warren said is an earlier step in the enforcement process. If the companies ultimately fail to address the issues, they could receive notices of violation from the department and could face potential fines. “In both of these cases, we were already aware of those issues and are pursuing progressive enforcement action” against the companies, DePoy-Warren said. Sears with the Environmental Health Strategy Center noted that all of the manufacturers of infant formula have reportedly stopped using BPA in their containers, which she said indicates that alternatives are available in the marketplace. Correction: An early version of this story misstated the Maine Department of Environmental Protection’s enforcement action against one baby food manufacturer. While a “letter of warning” has been prepared to send to Beech-Nut, DEP staff have drafted a letter to SuperValu, the manufacturer of Wild Harvest Organic products, requesting information certifying that the company is in compliance with state laws regarding BPA. Failure to comply with the certification compliance letter could result in a subsequent letter of warning.